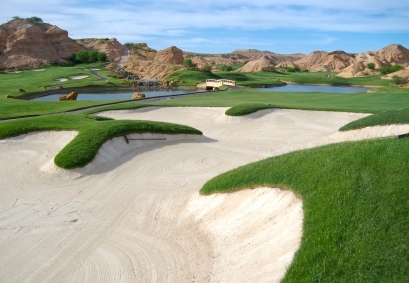 Pictured above: Golf course near the fast growing town of Mesquite, Nevada. T.L. and Harriet thought that retiring to cruise the world on their new sailboat would be a fun retirement. But that was only the beginning chapter. Just four years later, the charity they started for Caribbean children is making a huge difference in literacy and preparation for life. The Linskey couple is the 4th in our series of interesting retirement profiles. Click on a state to see reviews of 752 great retirement towns, plus a list of 1,445 active adult communities. The extraordinary thing about Mt. Airy is that it was the model for "Mayberry" in the popular Andy Griffith TV Show. You can catch a play at the Andy Griffith Theater or a bluegrass concert at the Downtown Cinema Theater. The town is located in the popular retirement area of northwestern North Carolina. We have seen a number of articles quoting research that investors who don&apos;t panic when markets get crazy do much better than those who sell everything. Here is a timely one from WSJ MarketWatch. This old farming town in southeastern Nevada is grown very fast. Mesquite is home to at least one giant active adult community as well as some casinos. Winter temperatures are moderate. Better to Buy in a New... or Existing Community?